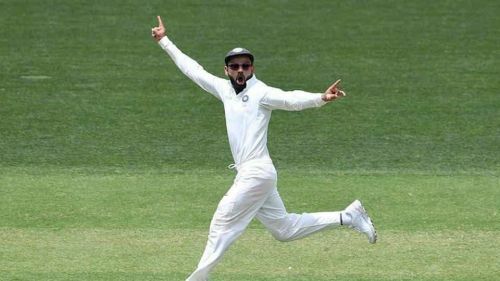 Indian skipper Virat Kohli was seen dancing hilariously while fielding in the slip region on the third day's play in the ongoing First test match between hosts Australia and India at the Adelaide Oval. Team India are currently playing the first of the four-match Test series against the Tim Paine-led Australian side at Adelaide. While David Warner and Steve Smith remain the major absentees for the Baggy Green, the 19-year-old Prithvi Shaw had to miss the first test due to the ankle injury he sustained while playing the four-day practice game at the SCG last week. Kohli opted to bat after winning the toss at Adelaide, as India posted 250 runs on the board courtesy Cheteshwar Pujara's monumental knock of 123 (246). Except for Pujara, every other Indian batsman failed to get going with the bat in the first innings, finding the Aussie bowlers hot to handle. Josh Hazlewood was the prime wicket-taker for the hosts, with Mitchell Starc, Pat Cummins and Nathan Lyon scalping two wickets each. In reply, Australia was off to a disastrous start losing Aaron Finch for a nought in the third delivery of the very first over of their innings. They finished day two on 191-7, courtesy a crucial half-century from local-boy, Travis Head. The hosts resumed day three from where they left on day two and added another 44 runs before being bundled out for 235, thereby falling short of India's first innings total by 15 runs. While Travis Head top-scored for his side with 72 off 167, Jasprit Bumrah and Ravichandran Ashwin were the prime tormentors for India with the cherry. During Australia's batting on the morning of day three, the Indian skipper Virat Kohli, who was fielding at the slip region seemed to be happy with his side's bowling performance and was spotted dancing hilariously. Virat put on his dancing shoes during the rain-marred first session play on day three and it was not bad, to be honest! India must try to capitalize on the slender lead they have got in the first innings by putting runs on the board thereby setting the hosts a challenging as well as a daunting target to have any chance of sealing the Adelaide Test, which would give them the much-needed momentum going into the second Test at Perth.